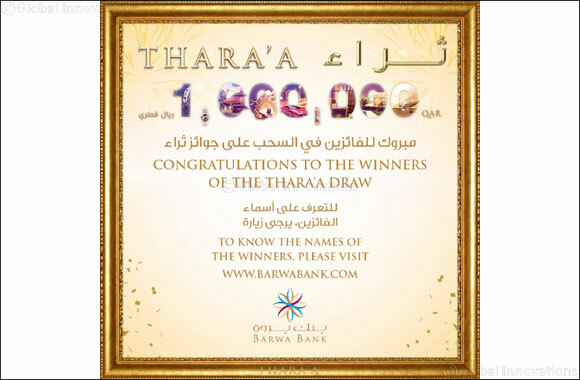 Doha, Qatar, April 15, 2019: Barwa Bank, Qatar's most innovative Shari’ah compliant bank, announced the names of the most recent round of draw winners for Thara’a, its Shari’ah compliant savings account, at the Bank’s headquarters. As the draw results showed, Ahmed Fouad Menisy and Mohamed Abdunnaser El-Gamudi each won a cash prize of 50,000 Qatari Riyals. Also, a cash prize worth 25,000 Qatari Riyals was awarded to Hussain Sultan Al-Jaber and Mohamed Yacine Ben Lamnouar.